The Blossom Wood – Dig Delve – An online magazine about gardens, landscape, growing & making. The Blossom Wood was one of my first projects here. 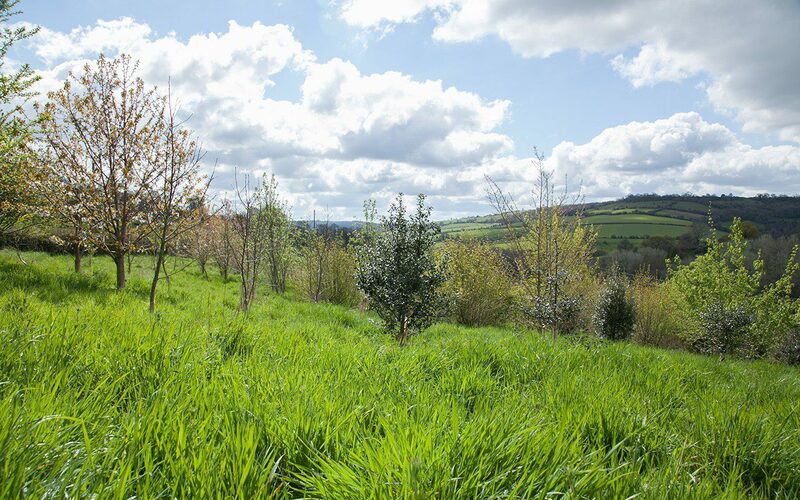 Plant trees at the beginning of a project and by the time you have started to round the corner, you have time mapped in growth and your efforts rewarded in the satisfaction of being able to stand in the beginnings of their shadow. 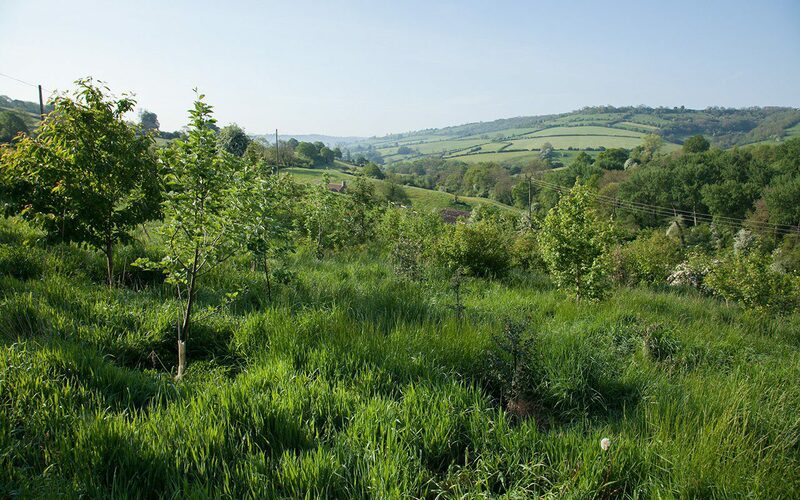 Such has been the case here and now, in the sixth spring after planting, we can already walk into the corner of our top field and find a place transformed into the start of somewhere new. 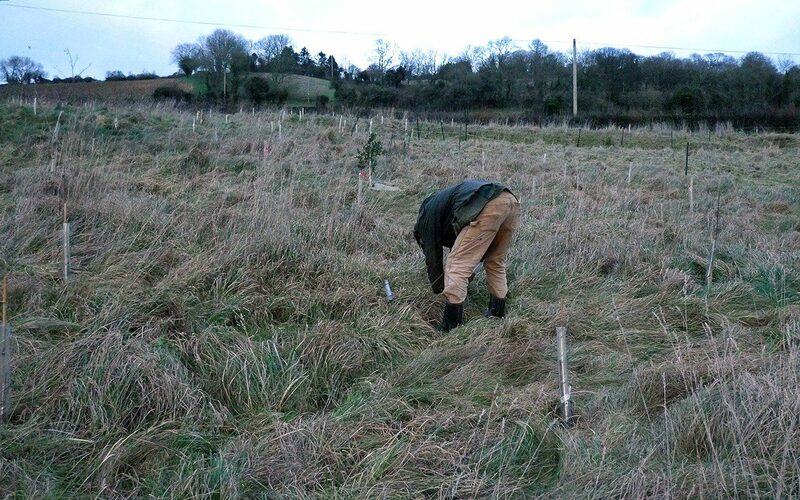 The idea behind the little wood was that it be a sanctuary; for birds, insects, mammals and ourselves. The fields were all but empty when we arrived. You could see from corner to corner and there was no shade other than the fingers borrowed from our neighbour’s trees across the stream. 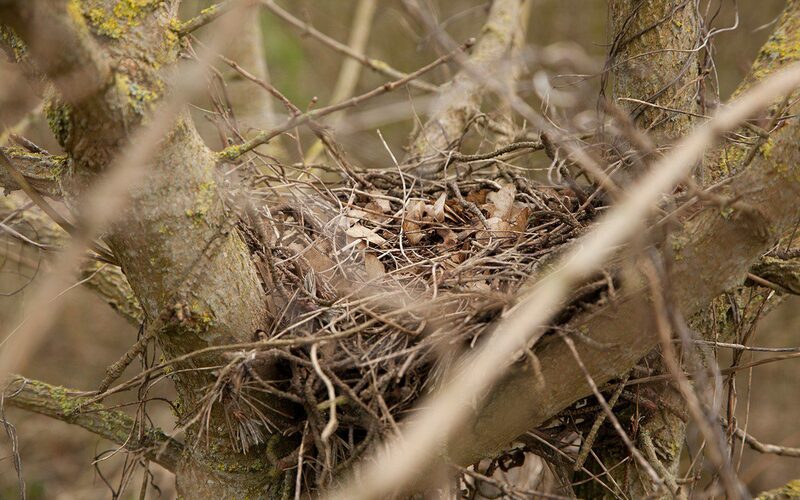 The birds had to hop from hedge to hedge and it was quickly clear that we needed somewhere that they could call home on our side of the stream. 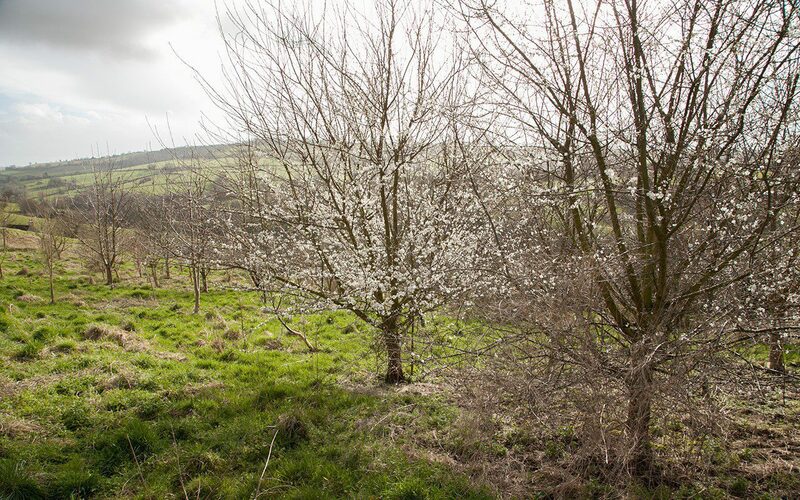 Save the occasional hawthorns that have matured into trees where they have been left in the hedgerows, we all but miss the blossom season and the celebration of spring that comes with it. So all the trees and their associated understorey are native and I have aimed for everything (save a handful of field maples, some spindle and an oak or two) to flower conspicuously and then provide berries for autumn. 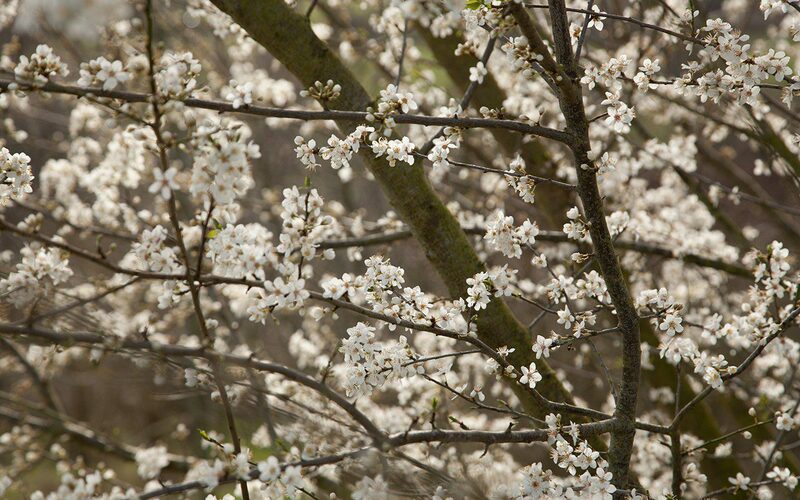 The cherry plum, Prunus cerasifera (main image), breaks with winter. The buds, pinpricks of hope, swell at snowdrop time. Early on we picked twigs and, now that they are grown, whole branches to bring into the house to force with willow and hazel catkins. After a couple of days in the warmth they pop, pale on dark twiggery and smelling of almonds. 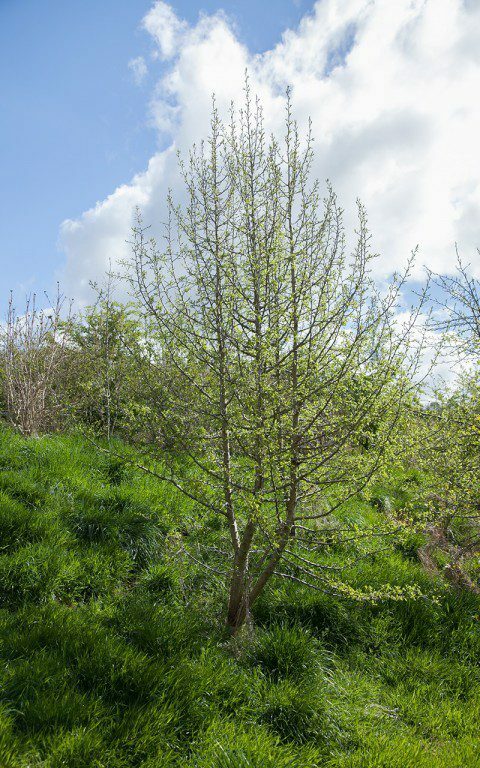 Prunus cerasifera is the parent of the Mirabelle plum, which is the first tree to flower in the plum orchard too. It is so worth this early life, which can sometimes appear in the last week of February, but the trees are always billowing by the middle of March. 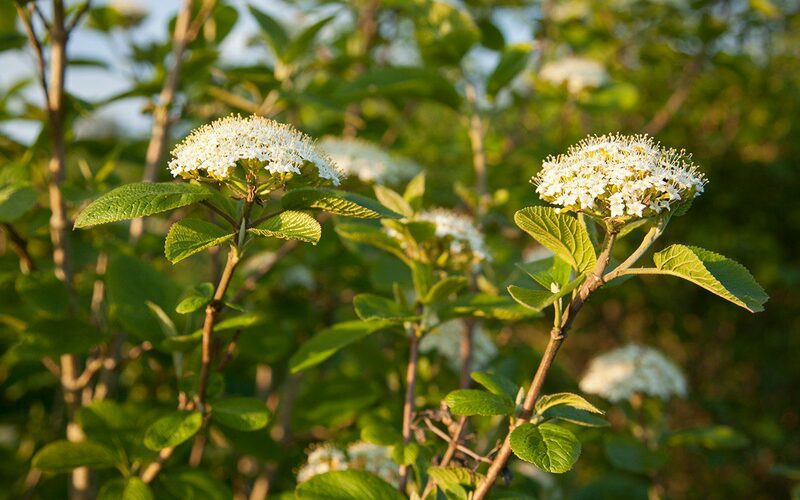 Rather than the wood erupting all at once the flowering sequence is staggered and broken so that, from the cherry plum now, until June when the wayfaring tree, guelder rose and sweetbriar are flowering, there is always something to visit. If I had left blackthorn in the mix it would be the next to flower, but I removed them after they showed early signs of running. Better to have them in a hedge that can be cut from both sides and where their tiny sprays of creamy flower appear with the most juvenile pinpricks of green on the breaking hawthorn. 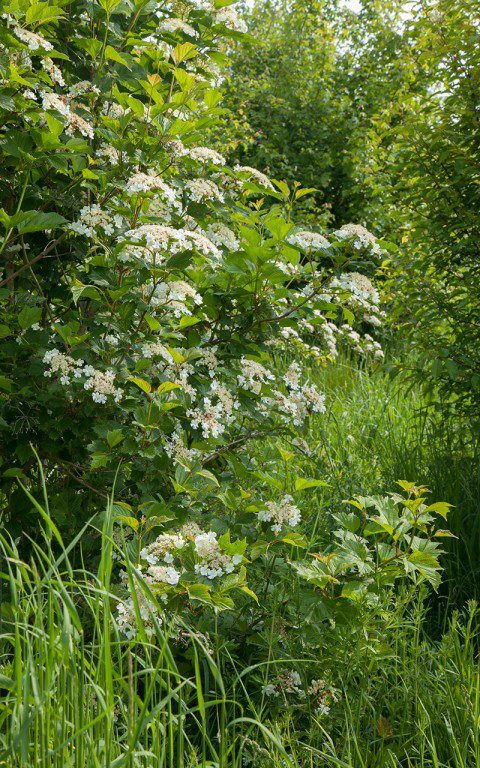 The hawthorn and the native Cornus sanguinea are fast and have been used as nurse companions to provide shelter to the slower growing species. 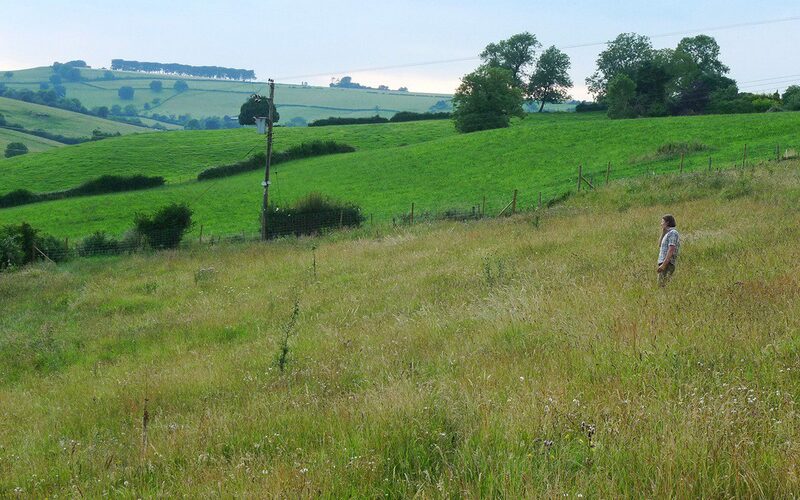 I want to see how this place evolves unaided, so have decided not to intervene, but I will probably coppice a number to make some more space if I see anything suffering that I need for the long term. The wild pear, Pyrus pyraster, is a tree I do not know well but have already learned to love. It flowered for the first time last year, a smattering here and there, but I hope for more this spring. 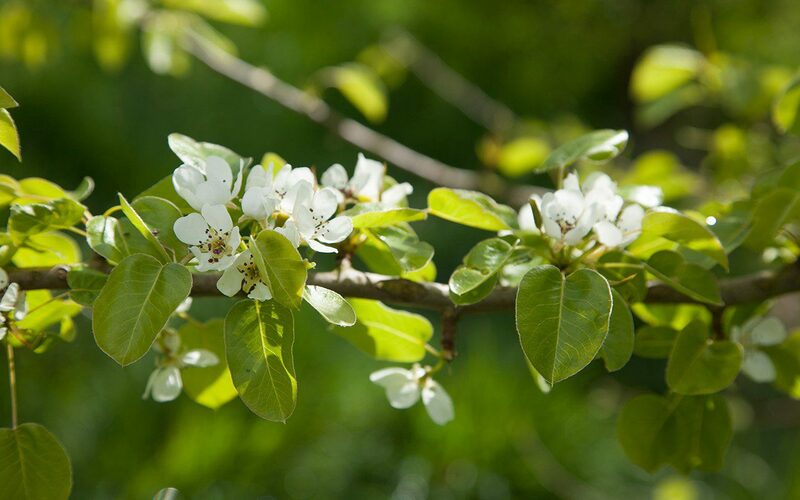 Pear flowers are one of the most exquisite of all spring blossoms, the milky flowers, round and ballooning fat in bud and then cupped and beautifully drawn with stamens. 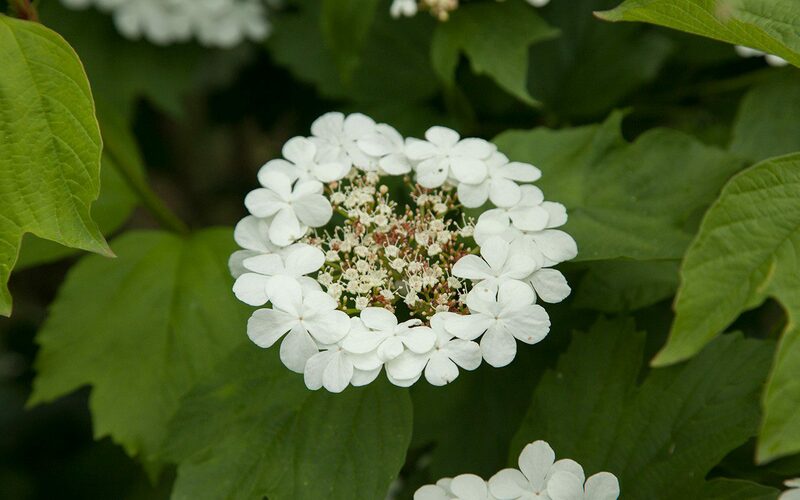 The flowers often occur with the very first leaves, lime green and creamy white together. You can see the trees are going to be something. ‘Plant pears for your grandchildren’ they say, for they take time to fruit and go on to live to a very great age. My youngsters, which I planted with all the other trees as whips, are well over twice my height, stocky at the base and showing stamina. 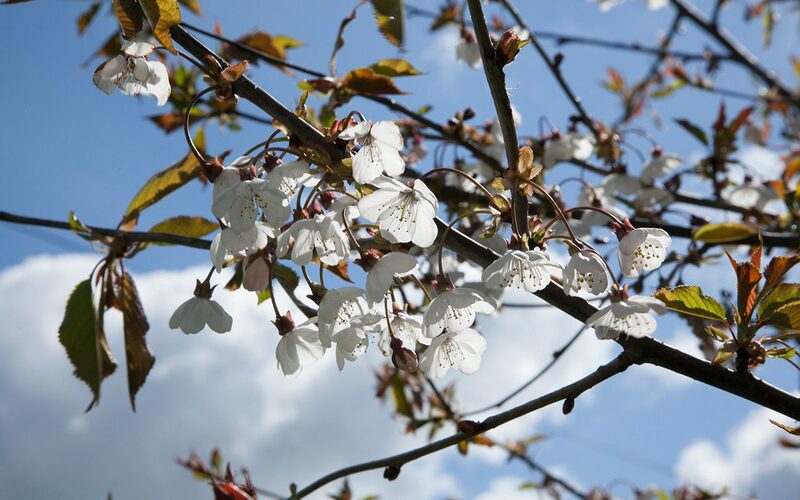 As spring opens up and first foliage flushes, we have wild gean, Prunus avium, to make the transition from leaflessness. The trees are racing up, bolting visibly with each year’s extension growth and already taller than most in the mix. The flowers are fleeting, lasting just half the time of the beautiful double selection ‘Alba Plena’. The wild gean is beautiful though, whirling at the ends of the branches, the flowers are finely held on long pedicels and dance in the breeze. 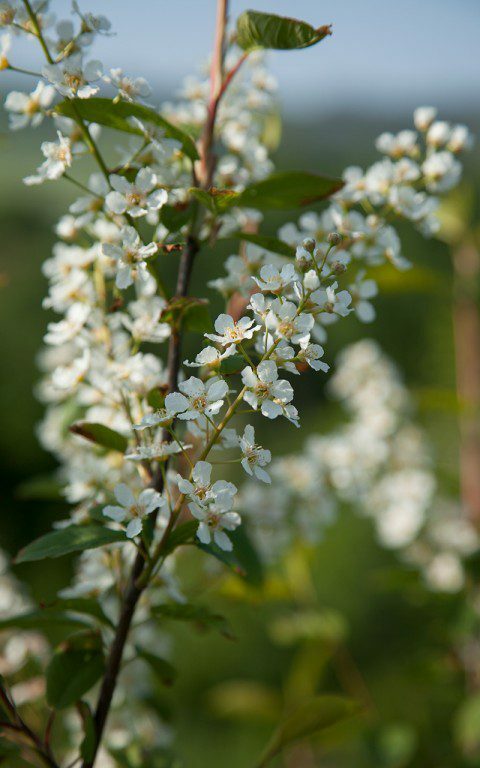 Next comes the bird cherry, Prunus padus, with long sprays of creamy blossom. I have it on the lower, damper ground where it is happiest. Three sorbus follow and come into flower once the wood has flushed with leaf. 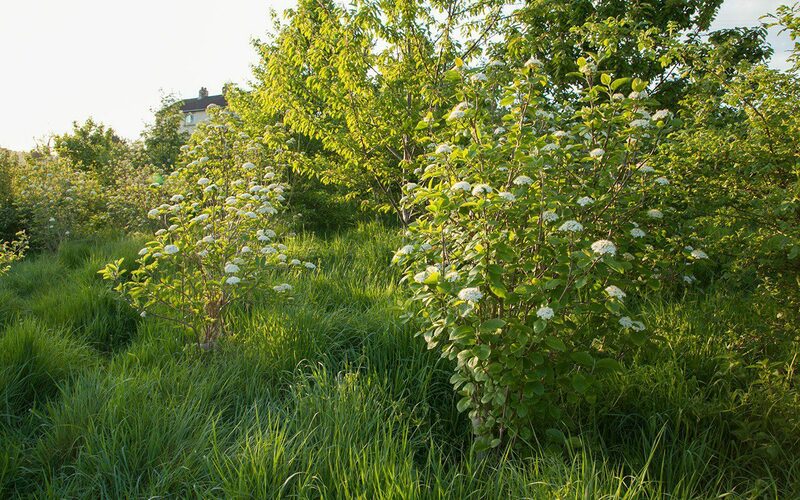 Rowan (Sorbus aucuparia) with its feathery foliage is planted close to the pears, which will eventually take over. Despite the fact that rowan are said to be long-lived, in my experience, on rich ground and in combination with other species, I have found them to be quick off the mark at first, but affected by the competition later. 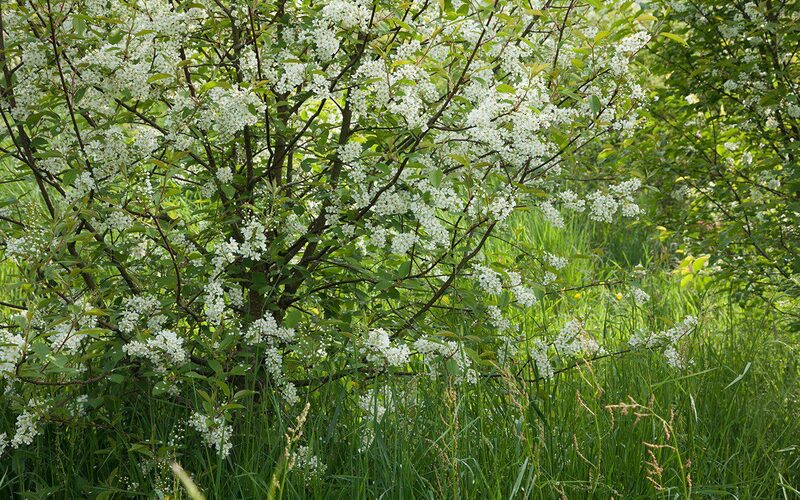 I wanted to plant whitebeam (Sorbus aria) with the gean because I love the blossom and silveryness of the newly emerging sorbus foliage together. However, now that these trees are maturing and fruiting, I see that I have been mis-supplied with Sorbus x intermedia, a Swedish native. No matter, they are magnificent fruiters, bright scarlet in autumn. 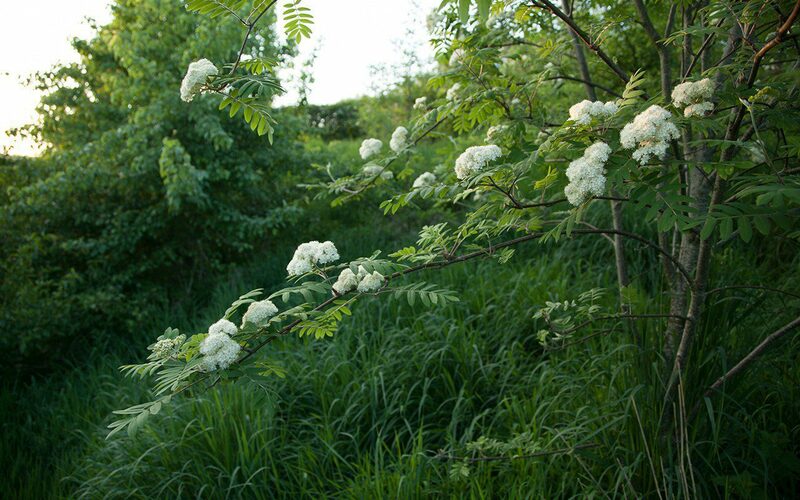 The chequer, or wild service, tree (Sorbus torminalis) is the third. Now a very rare tree in the wild, mainly confined to ancient oak and ash woodland, it is a delightful thing, with leaves more like a maple and marble-sized russet fruit that, from medieval times until fairly recently, were bletted and used as dessert fruit (reputed to taste like dates) or to make beer. My young trees are slender and have only just started flowering, but I have a feeling they will become a favourite. I have given them room to fill out and mature without competition. My childhood friend Geraldine left me a few hundred pounds in her will when she died and I put it into planting the wood. A naturalist to the core, I know she would approve of this place which is the domain of wildlife and where the gardener is just a visitor. 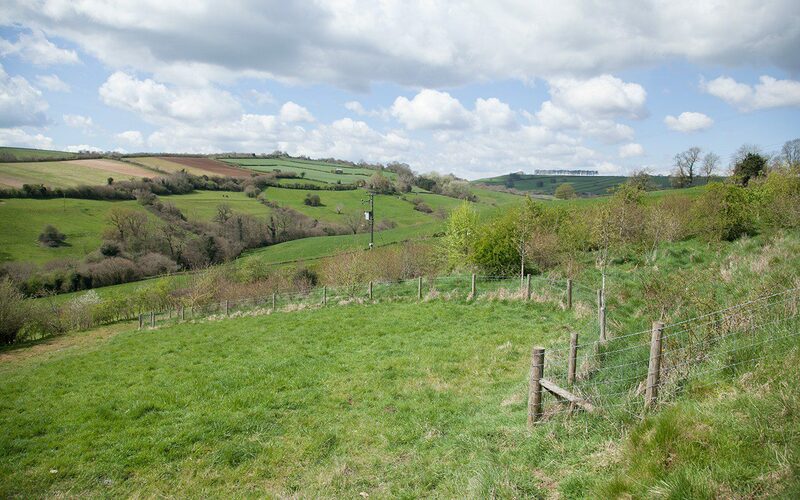 We find ourselves very much the interlopers here when we visit, disturbing flurries of the birds I’d hoped for, and seeing the tell-tale signs of unseen badgers and of deer seeking cover in the soft beds of grass where I have deliberately left a couple of clearings. I know already that I will be cursing them when they become bolder and find the garden, but it is good to see that, in less than a decade, we have a place that lives up to its name.